Vibration Isolation and Seismic Control Basics: Mechanical vibration and vibration-induced noise are common sources of occupant complaints in modern buildings. Vibration is caused by reciprocating motion from rotating components within mechanical equipment. All reciprocating, or rotating equipment should be isolated to reduce transmission of vibration into the structure. Our Noise Control provides technical assistance in the selection and specification of tailor- made isolation systems and vibration isolation products that enable building owners to install complex heating, ventilation and air-conditioning systems without the worry of vibration problems. Easyflex offers a wide range of Spring Isolator options suitable for the complete spectrum of vibration isolation applications Broadly speaking, spring isolators are used to the transmission of vibration produced by heavy machinery, mechanical equipment and even seismic activity into or within the structure of a building. vibration can also affect the performance of sensitive equipment and result in unpleasant (or even illegal) working conditions for employees. We offer Free Standing, Restrained and Housed Models depending on the application. Easyflex Anti vibration Rubber Pads are made from superior quality rubber materials, our Anti Vibration Rubber Pads serve consistently for longer period of time. 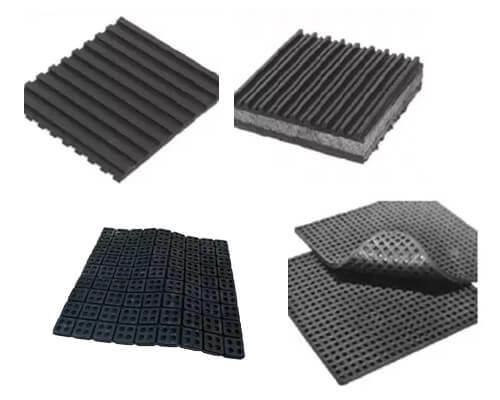 Our anti vibration rubber pads are widely acclaimed by our customers because these rubber pads insulate high frequency vibration and sound. We offer a wide range of anti vibration pads, which can reduce and dampen the vibrations caused by machineries, air-conditioning and refrigeration plants and many others. In order to isolate vibrations caused by Heavy Equipments it is highly recommended to install a flexible connectors at the outlet of these devices. It is necessary to select an airtight & leak free joint with good weathering qualities and one which will withstand the temperatures inside and outside the duct or pipe.